Once the snow begins to fall, it’s important to keep an eye on your roof, deck, and any other structures around your home. 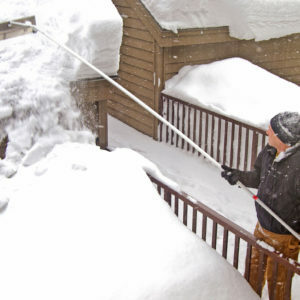 Removing snow in a timely and safe manner can help avoid ice buildup and collapse issues. Injuries from falling snow and ice. Ice dams can form on roofs and gutters leading to water damage. Carbon monoxide poisoning can result when chimneys and vents are blocked by snow and ice. Keep an eye out for early warning signs like sloped ridgelines, sagging ceilings, or cracked windows that may indicate concern. Use proper precautions to ensure safe and timely snow removal. Use a snow rake to clear your roof when possible. Know where the electrical lines are and stay clear of them with the rake. Be aware of the location of skylights and roof vents before removing the snow. If you must get on the roof, move cautiously with the use of a safety harness on steeper slopes to prevent falls. If using a ladder, make sure to place on secure footing. If possible, when removing snow from a pitched roof, work with another person who remains on the ground. Leave 2 to 3 inches of snow on the roof to help avoid shingle damage when clearing snow and ice. Always shovel down the roof. Shoveling upward can cause shingle damage. Removing snow from at least the bottom 4 feet of the slope and around valleys will help eliminate ice back up. On metal roofs, install snow guards above entrances. Avoid using salt or chemical snow-melt products to melt any ice on the roof. These can erode shingles and gutters and potentially void the roofing manufacturer’s warranty. Stay hydrated and know your limits to prevent back and other physical injuries. If it looks like there are signs of damage due to snow build up, call a qualified contractor to help remove the snow and stabilize the structure. Remember, the best way to stay safe and prevent snow load and ice back up issues is to shovel your roof and other structures consistently throughout the winter months!